A major stream of research at RWTH-TIM is on open innovation in the realization stage of an innovation project, i.e. transferring and utilizing technological knowledge from an organization’s periphery to improve the productivity of technical problem solving. Along this line of research, we work with a number of companies and industry associations on establishing an open innovation framework or utilizing the upcoming platforms and intermediaries for open innovation (see our study The Market for open innovation). Also, open innovation became the largest topic for executive education classes that I am giving this year. From these projects and executive classes, I realized a number of repeating factors that seem to influence the implementation of open innovation. In a blog posting by Science Business, a UK news service that wants to facilitate the matching of buyers and sellers of emerging technologies, I found a nice article that supports my own observations. The report is about a qualitative interview study on the state of implementation of open innovation in the world’s 30 largest health care and manufacturing companies. The study has been carried out by the UK consultancy group PA Consulting. In the report, open innovation is defined broadly (in the understanding of Henry Chesbrough) as the practices of a company to work with partners, agencies and other companies outside its organization to foster innovation (note that my own definition of OI is a bit closer and focused on practices that build on rather informal, ad-hoc and large-scale organizational mechanisms to connect seekers and providers of technical knoweldge). Only few companies have so far adopted a structured or company-wide approach to practice open innovation. At the same time, open innovation and customer co-creation are becoming more and more separated. The term “open innovation” is used for technology or knowledge transfer for a given technological challenge in an innovation project, while the term “(customer) co-creation” is being used to address practice of integrating users and customers in the early stages of the innovation process. Both areas have different methods, different responsibilities, and different people driving them in an organization. Respondents in the PA Study felt that it can be difficult to gain buy-in and resources for open innovation projects and those involved in open innovation can feel marginalized and under pressure to show results. To be successful in open innovation, the top of the business have to champion the process. Leadership also is critical to building the outward-looking culture that is essential. An engaged, enthusiastic CEO or head of function can do much to engender a similar attitude in employees, and get open innovation accepted. Open innovation is seen as a strategic necessity in sustaining innovation leadership. Some also saw it as a possible cost-saving response to the present downturn. This is strongly confirmed by own observations in Germany. Many companies are interested in NineSigma or InnoCentive today as they see it first of all as a means to increase the efficiency of problem solving, i.e. save cost and reduce financial risk. Only few companies are yet able to construct and appraise an objective business case for open innovation, or have a reliable measuring system to proof the value it brings to their business. This is one of the largest fields where applied research has to start. Open innovation requires dedicated organizational capabilities like relationship building, negotiating and the ability to pioneer novel legal arrangements. Here, we still lack both theoretical and practical knowledge about the exact nature of these capabilities, their success factors, and how to build them best in an organization. An important observation was how to get “ready for open innovation”. The only way to learn about open innovation is to pilot it. But in this process, formal training is an important part of its acceptance and its success. Often, one person is heading the OI initiative, but if you want to make it work, you need an entire team of people who all understand different aspects of open innovation across the entire company. 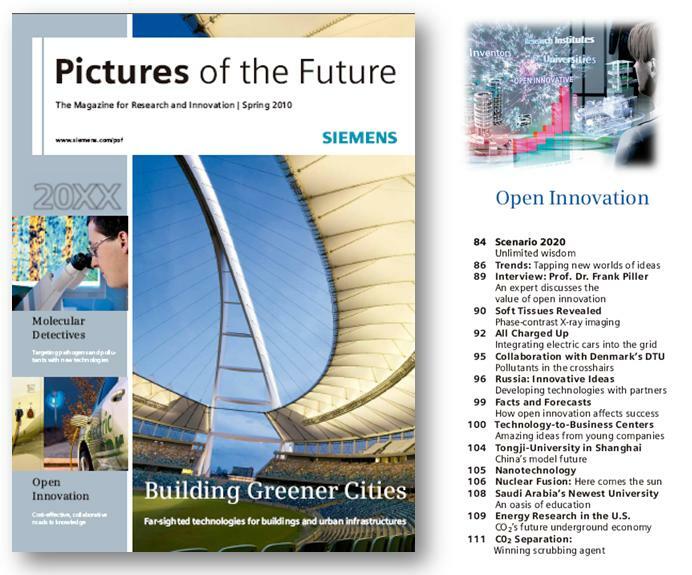 By the way, Pictures of the Future is the corporate magazine of Siemens AG, Germany’s largest technology company. The magazine reports several times a year about technological advancements, publishes trend studies and outlooks, both with regard to Siemens applications and beyond. 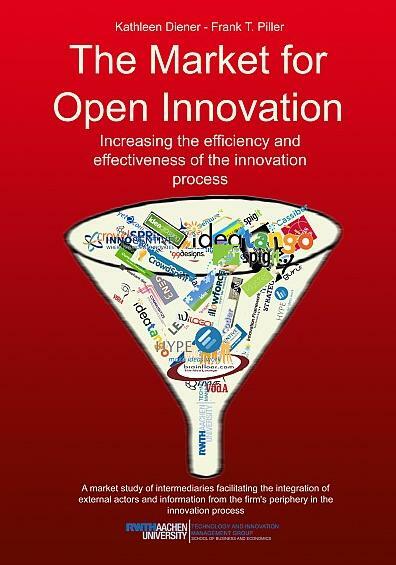 The recent issue (Spring 2010) has, among other themes, a very comprehensive special report about open innovation. It follows a broad understanding of the term and provides an excellent overview of this field from the perspective of a large corporation.